She put me in touch with her husband, who we will call Josh, by email. He informed me that he planned to invite “a few friends” over after our Lesson, to try out his food from the new Grill. No Pressure. We agreed that he would get most of the meats in advance, so we could do an abbreviated shopping trip before getting started. We did Recipes for Grilled Vegetables, Shrimp, Steak and Chicken Breasts. In this next part, here is the Grilled Shrimp Recipe. 1. Use fresh thawed Large Shrimp (I recommend 16-20 or 12-16). Clean, devein and remove shell (may leave bottom tip). Place on Wooden Skewers that have been soaking in water for at least 20 Mins. 2. Marinate Shrimp evenly in wet mixture of Olive Oil, Fresh Chopped Garlic, Dill and/or Rosemary to taste. Add a generous amount of BBQ Dry Rub (click for Recipe). Finish with Fresh Squeezed Lemon Juice. 4. 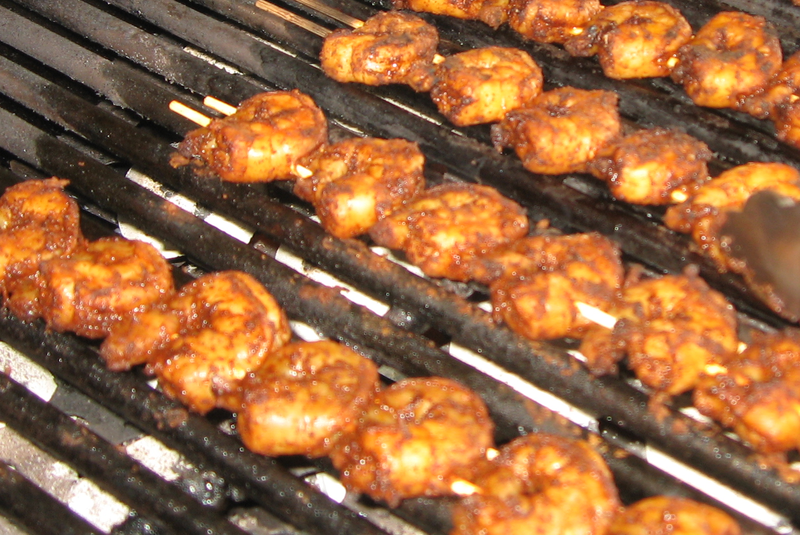 Grill Shrimp on Medium, or Low Part of Grill, may also use upper Warming Rack. 5. Cook evenly for 4-8 Minutes per side, until no longer translucent. Do not overcook. 6. For serving, may take off of Skewers and serve with wedges of fresh Lemon and/or Shrimp Cocktail Sauce. Enjoy. Also look for Recipes for Grilled Veggies, Steak and Chicken Breasts from this Session.